In order to end global hunger and malnutrition in this lifetime, the UK government needs to increase investment in agriculture, urges members of the UK parliament in a new report released today. Home Grown Nutrition, produced by the All-Party Parliamentary Group on Agriculture and Food for Development, outlines the key challenges facing food security, and recommendations for overcoming these challenges based on the series of Westminster- held debates. 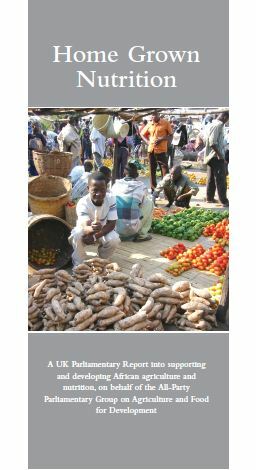 At the heart of these recommendations is increased support for the smallholder farmer, the source of food and path to nutrition for approximately one-third of the global population. Smallholder farmers, numbering an estimated 500 million worldwide, are already a focus of support from UK’s Department of International Development (DFID) through initiatives like Plantwise and other agricultural development programmes. Yet to defeat hunger, public and private investment must play a greater role to enable the smallholder to produce more, and more effectively, while boosting nutritional content and sustainability. The Group also notes in the report that food security is a highly complex issue for which agricultural investment alone is not the solution. This investment must be accompanied by action in other critical areas, including provision of nutritional supplements, wider-economy approaches (cash-transfers), the empowerment of women, access to healthcare as well as to clean water and sanitation. The APPG’s recommendations are launched in the run-up to the G8 summit next month in London, during which world leaders will be called upon to make commitments towards improved global nutrition. Days before, on June 8th, a Nutrition for Growth summit led by the DFID will be held in the capital to focus public and media awareness on this issue, further encouraging timely action to end hunger. As part of the UK’s commitment to nutrition, DFID will be supporting CABI’s work on an initiative aimed at spreading nutritional advice amongst developing communities via mobile phones.